Margaret is living the high life in London with her cousin and aunt, but when her cousin gets married, Margaret goes back to her humble, but peaceful life with her parents at a parsonage in Helstone. But all this changes when her father unexpectedly decides that he no longer agrees with his church, and will leave the religious calling to be a tutor in the Northern factory city of Milton. There, the family lives in relative poverty, but earns the friendship of Mr. Thornton. He is a self-made man, who worked his way up from curtain sales to merchant, and he would like to educate himself in the classics under the tutelage of Margaret’s father Mr. Hale. But Margaret is proud and thinks gentlemen and ladies should be considered higher than merchants. Although she appreciates the friendship that Mr. Thornton offers her lonely father, she looks down upon the merchant class and Milton in general. Margaret is in for an education, though. She soon becomes enmeshed in the union politics. She kindly bestows her friendship upon a poor factory worker’s family, and hears both sides of the union politics – the side of the factory workers as well as Mr. Thornton’s side. Much of this tome is dedicated to discussions on this subject, thus educating the reader on the subject. And of course, let’s not forget the romance. After a time, Mr. Thornton begins to admire Margaret, despite her lack of fortune. However, Margaret does not admire (or believes she does not) admire Mr. Thornton because of his lowly merchant class. There is a lot of romantic tension throughout the story. I have to say, although I love Jane Austen’s satires and I think she’s probably the better student of human nature, Elizabeth Gaskell is by far the better student of societal issues. In fact, I’d say Gaskell is a fascinating mixture of Austen’s romance and Dickens’ social commentary. Throughout my reading, I learned a lot about why unions were developed and what good (and bad) they did the factory workers. I also learned about class structure between the merchant and the gentry. Gaskell described the poor working conditions and low pay that the factory workers suffered. But she also showed the reader how a strike, in those early days of unions, could make the poor laborers lose money and suffer consequences when scab workers are called in. They can, in fact, be ruined themselves. On the other hand, Mr. Thornton carefully explains why he’s making the choices he’s making in response to the union strike, and you can’t help but feel his pain as well. 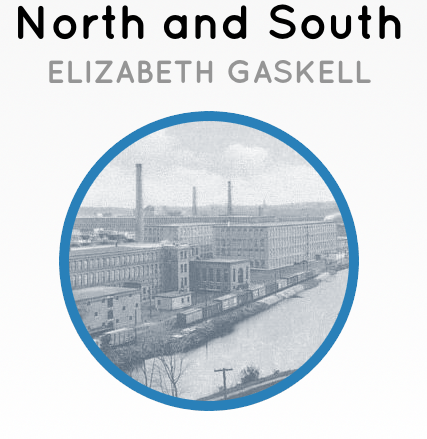 Overall, an excellent novel, and I look forward to reading more Gaskell in the future. North and South is a favorite! I read Cranford in 2016 (shorter, sweeter, and charming) and hope to get to Wives and Daughters soon. I just skimmed this because of the possible spoilers. Thanks for the warning. I look forward to finally reading this. I love the promise of all that great social commentary. So glad that you liked it.